What an amazing job. Just need a pick guard and maybe repair the original tail piece. very nice looking guitar... What year? How's it sound? 1953 6015. I have to get it home from work to play...but played a few strums and it sounds great. It has new frets! We need more of these vintage archtops on this site...….they're just so pretty Here's your guitar's father, '41 Synchro. Rob has his twin brother. Did these come with the deco bridge like yours? Last year for the Synchromatic stairstep bridge was 1951-- at least on these models-- so the straight bridge should be correct for 1953 vintage. What started out as the Synchromatic model 100 in the late 30's evolved into the 6014 (sunburst)/6015 (natural) model... later called the Corsair by '54. So if yours is a '53, it's still technically a pre-Corsair. PLEASE add it to the database! Very Nice guitar! I have a 53 as well. Labeled 6014-5. I made my own pickguard for her. Nice Andreas! The pick guard looks great too. I’m not sure I’m as handy as you when it comes to pickguards. Do they reproduce them? Beautiful guitars and congrats to the OP on a great find. Here's mine again but with the original pickguard back on after it took a voyage to Frank in the Netherlands to get rebound. Paul Setzer doesn't do binding and he recommended Frank. It's multi-bound like the original, which BTW arrived in pieces in a baggie in the case pocket when it arrived! Don't know when they dropped the carved top, lovely full tort binding and replaced the brass tuner buttons with ivoroid, features mine and Rob's have, but I think it was shortly after the war ended and the model got a new designation. IIRC, by '53, the only Gretsch archtops that still had a carved top were the custom order only Fleetwood & Eldorado. There seem to be more of these models in the beautiful natural finish like ours and the years have aged them all beautifully. If you move the bridge base you'll see the original finish color and it should be much paler than the rest of the body, not being having been exposed to light. Here’s my pick guard that fell off when I took it into the shop looking like 65 year old pizza. I suppose I got lucky on mine... The pickguard is original-- the only blemish is where a former owner glued plastic letters spelling "ACE" onto it. But they're staying-- it's part of the guitar's provenance. Also notice the difference in the pre-war F-holes on mine and Dave's (model 100's); versus the larger, more modern F-holes on the 6014/15 models. Interestingly, several years later a patent for more or less the same thing was granted to a Peter Sceusa, despite clearly not being a new invention. Rickenbacker used the "Sceusa neck" on occasion. Was the neck coming loose? I had an old guitar with a high action, no truss rod so the tech heated the fretboard and bent the neck to the proper angle and let the glue harden, problem solved! AND it stayed that way. Mine has the asymmetrical Gretsch "Miracle Neck". Quite honestly, it's the sweetest guitar neck I've ever played. Thank you! These pickguards are not reproduced. I havet enough material to make another one. PM me if interested. I'm a pushover for that stuff. Beautiful. The asymetric neck was called a "non-pressure" neck; it is not what is patented as the Gretsch "miracle neck." The miracle neck was actually a way of using a laminated fingerboard so that it would fit into the neck with a tongue-and-groove joint, thus obviating the need for a truss rod. 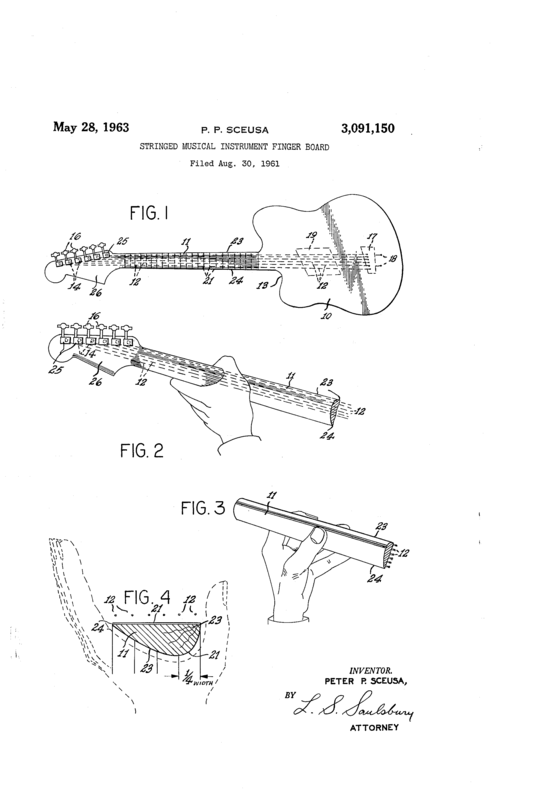 Gretsch used the "miracle neck" patent as a catch-all marketing name to tout their superiority to the competition, all the while using a metal non-adjustable truss rod. Unfortunately, Gretsch didn't patent the asymmetric (ergonomic) neck which is why Rickenbacker got the patent in '63. Mine has the asymmetric neck just like Rob's and it has a non-adjustable truss rod - I checked with a magnet. This Miracle Neck I could do without but it's sort of here nor there. In comparing this standard width (1.685") and offset, somewhat deep U [or V] profile to my Super Chet's wider (1.80") neck with a shallow C profile, it's easier to fret with my thumb on the SC than the Synchro.